Hold It Right There: Teapot Dome Belongs to the People! The government just sold off the once-controversial land. Here’s what they should have done with it instead. The news that ownership of the Teapot Dome oil field in Wyoming recently passed from public to private hands for the first time in American history has been greeted with a collective shrug. That response befits the nation Gore Vidal renamed, late in life, with painful aptness, the United States of Amnesia. Yet one might have hoped that the sale would at least have picked a little at the scar tissue covering what was once, before Watergate, one of the sorest wounds the legitimacy of the US government had ever received. Instead, Politico’s anxiously reassuring headline about the transfer, “Government sells Teapot Dome—on the level, this time,” sums up so much about our relationship, in 2015, with the American past. 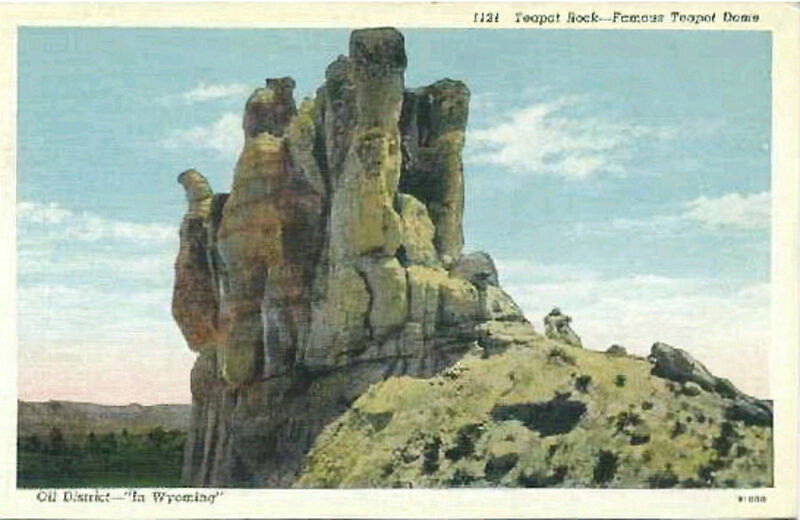 Exactly a century ago, in 1915, President Woodrow Wilson withdrew the oil-rich lands around Teapot Rock in central Wyoming and assigned them to serve as reserves for the Navy. After World War I, the Navy transferred them to the Department of the Interior, headed in the administration of Warren Gamaliel Harding by one Albert Fall. In an ominous fit of Rahm-like privatization, Fall leased the lands to oil companies on the cheap, without soliciting competing bids. So far, so good, at least according to the rules of the wheel-‘em-deal-‘em pre-1933 capitalism to which our own captains of industry are so desperate to return. But where Fall erred was in accepting bribes from the companies amounting to several millions of dollars, adjusted for inflation. It took a few years—and the Pulitzer Prize–winning efforts of unjustly forgotten investigative reporter Paul Y. Anderson, then of the St. Louis Post-Dispatch, later the longtime Washington correspondent for The Nation—but eventually Fall was convicted of bribery and became the first (until Nixon’s Attorney-General John Mitchell, the only) former Cabinet-level official to go to prison. “The Multimillionaire Goes Free,” read The Nation’s editorial the following spring, when Harry F. Sinclair, one of the oil magnates who had bought off Fall, was acquitted. From the Pacific to the Atlantic men and women…are declaring that it is settled that there are two kinds of justice—one for the rich, one for the poor. They are right, and their knowledge of this fact will do more harm to American institutions than all the soap-box orators who may be preaching a radical change in our form of government in the streets of our cities. Destroy faith in the equality of all men before the courts, and you go far toward toppling the government. Back in government hands, the Teapot Dome field sat dormant until the 1970s, when oil production resumed and the Navy transferred title to the Department of Energy. Since 1976, drilling on the land has plugged more than $569 million into government coffers, and for awhile at least, the oil was being sold at suspiciously familiar below-market prices. Then, late last month, the Energy Department announced that it had sold Teapot Dome for $45.2 million to Stranded Oil Resources, a company that specializes in shooting carbon dioxide to loosen up the last little bits of petroleum left in the ground. The scandal isn’t what’s illegal, some guy once said; it’s what’s legal. A corollary for the twenty-first century: the real scandal is that what “faithless Americans” used to have to do illegally has been reframed as ho-hum and above-board. It’s probably too late, but some earnest, reckless public-interest lawyer ought to try to sue to keep Teapot Dome in the public hands. The National Park Service could build a museum about the history of what we’re endlessly assured is only corruption of an otherwise healthy body politic. It could open in 2022, on the centennial of public disclosure of Fall’s deals. Maybe President Hillary Clinton would cut the ribbon. The deep significance of this goes beyond the recovery of the oil lands. Where are those soap-box orators?